Syllabi and comprehensive exam reading lists are often graduate students’ first major exposure to political science. In the field of IR, they tell students what scholarship matters for the field and – by omission – what doesn’t matter quite as much. What students read as graduate students likely influences some of what they cite later in their academic careers. What then exactly is in these important documents? Our new dataset GRADS – the GRaduate Assignments DataSet aims to answer that question. We encourage IR scholars to use it for their own research and teaching. The dataset provides readings from syllabi and reading lists, and we have coded the gender of the authors of these readings. Thanks to generous funding and support from NSF, APSA and our universities (UCI and Iowa State), we developed GRADS to be a public resource for political science scholars and any other social scientist interested in political science readings. The dataset includes 88,673 readings from 65 Ph.D.-level reading lists and 840 syllabi from Ph.D.-level political science courses taught in programs across the United States. We are grateful to the anonymous political science faculty who contributed their syllabi and reading lists as part of our IRB-registered study (see here for discussion of data collection). We also appreciate assistance from research assistants and project affiliates (see Acknowledgements). Scholars can search for different readings that are cited in the syllabi and reading lists, diversify work cited in teaching and research and examine trends in readings. The dataset allows for scholars to search for readings by keyword, title, author, gender of author, year, subfield and citation count. (As part of our research, we led a team of research assistants in coding the gender of the authors that appear in the dataset.) Below, we briefly discuss some trends in IR and ideas for using the dataset. In the dataset, scholars will find readings from 162 IR syllabi (about 19% of the sample) and 10 IR reading lists (about 15% of the sample). The following three readings appeared most frequently among the IR syllabi in our dataset, perhaps as a reflection of the increasing prevalence of rationalist scholarship in IR. Fearon, James D. (1994). “Domestic political audiences and the escalation of international disputes.” American Political Science Review, 88(3), 577-592. We can also examine gender representation in readings. An underrepresentation of women in readings (e.g. Colgan 2017) may inadvertently hurt the retention of female graduate students – therein contributing to the leaky pipeline in political science (Mershon and Walsh 2016, Monforti and Michelson 2008) as well as the leaky pipeline in academia more broadly (Van Anders 2004). Same-gender role models have been found to be critical for women’s socialization in male-dominated fields. (Asgari 2012). We find that, relative to other subfields, IR has the third highest representation of female first-authored readings. Here, we use the proportion of syllabus instructors who are female as a baseline. (We acknowledge that numerous other baselines could be used [see Teele and Thelen 2017 p. 436].) 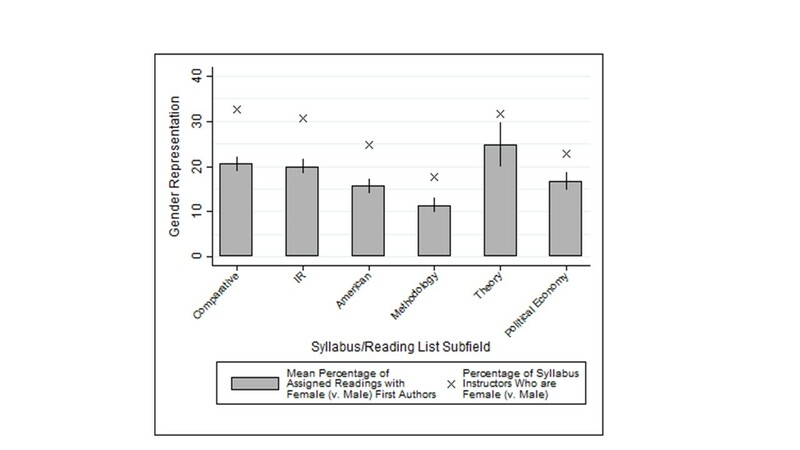 Figure 1 below indicates the average percentage of readings with female first authors by subfield. The ‘X’es represent subfield benchmarks: the proportion of instructors who are female. Source: GRADS. Whiskers represent 95% confidence intervals. We recommend several ways that IR scholars can employ our dataset. First, new post-doctoral scholars and new faculty may be looking for work to assign when creating a new syllabus. While a search engine such as Google Scholar can reveal new work, the GRADS dataset fills a distinct niche by showing what other graduate instructors are assigning to their own students. Instructors can search GRADS by year and by keyword. For example, an instructor may be preparing to teach a new course on international security and want to include readings on peacekeeping that were published in the last decade. Entering the word “peacekeeping” and specifying readings published “after 2008,” fifteen results pop up – ranging from Hultman et al.’s article on United Nations peacekeeping and civilian protection to Murdie and Davis’ article on the human rights consequences of peacekeeping. Second, since GRADS uniquely codes authors’ gender, instructors can use our dataset to find readings to increase gender diversity in their own syllabi and reading lists if they are interested in doing so. An instructor may find that his or her syllabus on nuclear weapons has few female scholars or that a syllabus on gender in IR has few male scholars. Instructors can then use GRADS to discover what others are citing on these topics and decide whether such readings would be appropriate (or not) for their own syllabi. Previously, posts have discussed some of the barriers to diversifying syllabi. For example, instructors may seek to ensure that canonical texts are sufficiently represented. Additionally, female-authored work is less represented (here and here) in the top journals from which many instructors may be pulling readings. More broadly, gender citation gaps in IR (here and here) and political science mean that instructors have less exposure to female-authored scholarship when compared to male-authored scholarship. (For discussion on gender representation in coauthorship, see here pp. 467-469 and here.) There exist additional structural barriers for those seeking to diversify syllabi along other dimensions, including race, ethnicity, nationality, sexual orientation, among others (see past discussion on inclusion). By choosing to diversify syllabi, instructors may help combat gender bias in IR (see also p. 472 here and the 2013 Monkey Cage symposium here) – especially if we assume that syllabi to some extent influence citations. Instructors can also use GRADS to diversify citations in publications. Some journals explicitly ask authors to consider gender representation in their reference lists prior to submitting papers (e.g. ISQ) and other journals have had discussions on the subject (here). Some past discussion in the Duck has sought to identify strategies for how to increase gender diversity in reference lists. In addition to GRADS, there exist several other resources for diversifying syllabi, reading lists and citations. The Women Also Know Stuff website has a database of female political science scholars whose work can be searched by area of expertise. The editorial board also runs a twitter account that regularly features female-authored scholarship. Several scholars who wrote this post also introduced a Women in IR bibliography. Additionally, scholars can use Jane Lawrence Sumner’s Gender Balance Assessment Tool to assess gender representation in their own syllabi. Third, scholars can employ GRADS to examine trends in the diversity of authors represented in assigned readings. To what extent are people of different genders, races, ethnicities, nationalities and sexual orientations represented in syllabi and reading lists? We are currently employing the GRADS dataset (including other data that we collected) to write two papers on factors that influence gender representation in assigned readings. In line with Jeff Colgan’s findings of a gender syllabi gap in IR, our findings indicate that a gender gap in assigned readings does exist – not only in IR but across all political science subfields. Such research builds on past scholarship demonstrating the persistence of gender gaps in citations in IR (here and here), as well as in political science more broadly and in numerous other academic fields (e.g. Pyschology here and here , Economics, Physics). Ultimately, such gender gaps may begin early: in graduate training. If students receive little exposure to female-authored work, they may be less likely to cite it in their own publications later in their academic careers. Finally, as scholars use our dataset, we wish to kindly note that the dataset is in Beta version. We acknowledge that errors remain, and we appreciate them being reported to us so that we may promptly correct them. The count of instructors treats each syllabus-instructor combination as a separate unit.